These muffins are perfect for a breakfast treat. They are filled with berries and white chocolate and topped with sliced almonds. In a medium bowl, beat together the egg, milk, butter, and vanilla. Slowly pour the liquid mixture into the dry mixture, and mix, until just incorporated. Fold in the berries and white chocolate chips, until just incorporated. Evenly divide the batter into 12 muffin cases. Each case should be about 3/4 full. Evenly divide and sprinkle the almond slices on the muffin batter. Bake for 30-35 minutes, until the tops are a light golden brown color. Remove from oven and allow to cool in the pan for 5 minutes. Transfer to a cooling rack to finish cooling. Recipe adapted from Nielsen Massey Fruity Breakfast Muffins by Eric Lanlard. 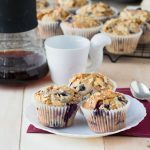 Get this recipe for A Berry White Chocolate Muffin at https://www.theworktop.com/breakfast-brunch-recipes/berry-white-chocolate-muffins/.